Snowflake Shimmer QAL - Finished!! Back in July, Yvonne who blogs at Quilting Jet Girl launched a quilt along for her gorgeous Snowflake Shimmer pattern. I just had to jump on that one - the design is just so beautiful! I'm so happy to have finished this one in time for the final link-up! And bonus - I absolutely love it! I chose three Kona solids to make my Snowflake Shimmer: Charcoal for the background, Ash for the middle stars and White for the snowflake. For the quilting, I was inspired by Yvonne who quilted hers pretty densely. I went with some dot to dot designs in the snowflake, pebbles in the stars and a large stipple in the background. For the backing, I chose to use a inexpensive sheet in a beautiful lavender colour. I just love how the quilting shows up on the back. I used matching Aurifil thread on the top and bobbin so although the thread blends in very nicely on the top, you can see all the details on the back. The finished quilt measures about 72 1/2" x 88 1/2". I really, really, really want to keep this one just for me, but I've already gotten comments from my sweetie that it would look perfect in the living room at the island house on the new grey couch. He's right - it would look awesome there. 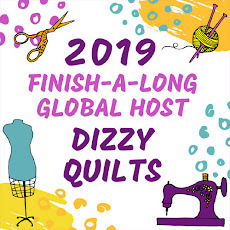 I will be linking up with everyone else participating in the QAL over at Quilting Jet Girl. And this was project number 4 on my Q3 2016 FAL list so I'll be linking up there too. And I will be sharing this finish over at Crazy Mom Quilts for Finish It Up Friday and at Celtic Thistle Stitches for TGIFF. I finished a Christmas quilt and it's not even October yet!! You might remember back in May, during the May is for Makers campaign, I purchased the Broken Frames pattern from Meadow Mist Designs. But it wasn't until I made my list of projects for Q3 of the 2016 FAL, that I decided I was going to turn Broken Frames into a Christmas quilt. I chose two charm packs of Cherry Christmas by Aneela Hoey, some Kona White and Kona Red, which I also used for the binding. For the quilting, I debated just doing some straight lines echoing the seams, but in the end, I went with two different FMQ designs: flowers and square spirals. I love all the yummy texture this quilting creates! The finished size is about 50" x 68" before washing - so a pretty good size for the couch. If you're in the market for a really quick and easy quilt - the pattern comes in 3 sizes (baby, lap and twin), I highly recommend this one. It would be perfect for that charm pack you've been hoarding or you can use scraps. This pattern is perfect for some fun fussy cutting and would make an awesome "I spy" baby quilt. I will be linking up at Crazy Mom Quilts for Finish It Up Friday and at for Crazy Dutch Bird Quilts for TGIFF. And this is project number 7 on my 2016 FAL Q3 list so I'll be linking up for that too at the beginning of October. If you've been following me here for a bit, you might remember the lunch bags I made for Christmas last year. It would have been so easy to just make one for her, but no... I had to try a new pattern! I found this one and got to work right away. I used some Cherry Christmas (by Aneela Hoey) charms I had leftover from a quilt I'm working on now and paired it with Little Apples fat quarters (also by Aneela Hoey). I didn't have interfacing on hand so the handles are a little bit "floppy", but other than that, I really like this little bag. And this super fun print for the lining. Do you have a favourite tutorial for a small bag? I will be linking up at Crazy Mom Quilts and at Chezzetcook Modern Quilts for TGIFF. I think I may have a problem... I just want to keep making zipper pouches! I'm working on a Christmas lap quilt this week, but I'm at the stage in the quilt making where I have to sew rows together and I'm not crazy about that step (all those loooooong seams!) So I decided to take a break and make something small. The Color Block Pouch tutorial was part of the list and I remembered that Debbie from A Quilter's Table made that pouch a little while ago. The design is very striking and it looked easy enough so I pulled some fabrics and got started! I found some leftover Curiosities by Jeni Baker for Art Gallery on my cutting table (I'm using it to make the Meadow Mystery Quilt) and then went through my solid scraps and found the perfect matches - Kona Charcoal and Kona White. See that little gap at the end there? I don't think it's supposed to be there! I used the Curiosities fabric for the back of the pouch too. I don't really have a purpose for this pouch yet, but that doesn't really matter does it? Maybe I could use it to carry my sewing supplies for the Montreal MQG sew-in days! So that's my small finish for the week! 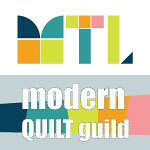 I'm going to link up at Crazy Mom Quilts and at Quilt Matters for TGIFF.